Next - I have two new original paintings to show you! 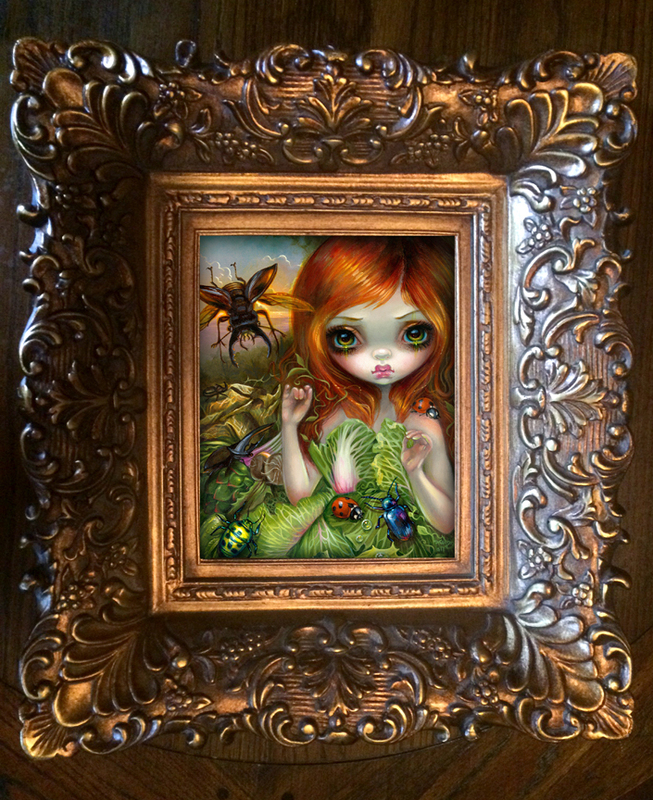 The first one was the result of the free custom painting I gave away at Patreon a few weeks back - the winner went with a dark Alice in Wonderland/Caterpillar them - the original has sold but we have prints & canvases for sale here, she is "Faces of Faery 238"! 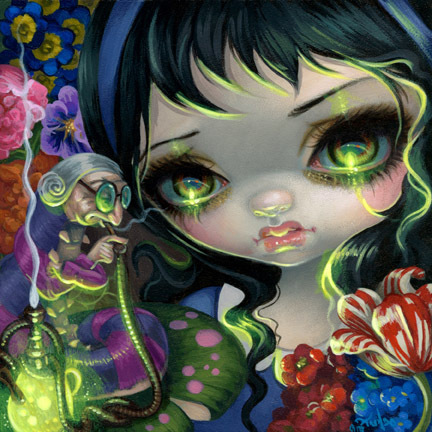 The second original painting is one that sold at my Insectarium show - her name is "Insectarium II: Carnivorous Plants" - prints and canvases are available here. To see any other original paintings that are actually still available to purchase (they tend to sell quickly! ), click here. Next - I am GIVING AWAY a new original painting up at Patreon! A Tiny Treasure with a Dia de los Muertos theme! Subscriptions at Patreon start at just $1, anybody signed up by next Wednesday the 6th will be entered automatically, just click here for details. 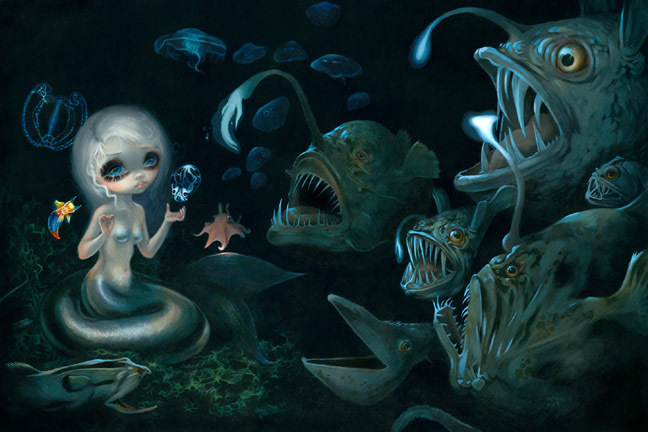 In other news - the SALE print of the week is my beautiful "Amongst the Koi" - if you love mermaids, big eyes & koi ponds you will love this one - on sale from only $9.99 worldwide here. And finally - it's time for new ACEO cards and I have a grand total of ten brand new beauties up for auction here - some of these will be paintings you have never seen before! I only make one single ACEO card for each painting I do, so they are truly one of a kind. Trading card sized canvas prints, hand embellished by me in acrylic paints, signed & numbered #1 of 1, bidding always starts at a penny here. Please ignore the "Jasmine's out of town" warning as I will be back home before the auctions end and I can mail them with no delay! This was so much fun! Several weeks back when we hit our first Patreon Goal, I picked a random Patreon patron to win their very own free custom painting! The winner decided they wanted me to go with a dark Alice in Wonderland theme with a hookah smoking caterpillar and it turned out really neat! 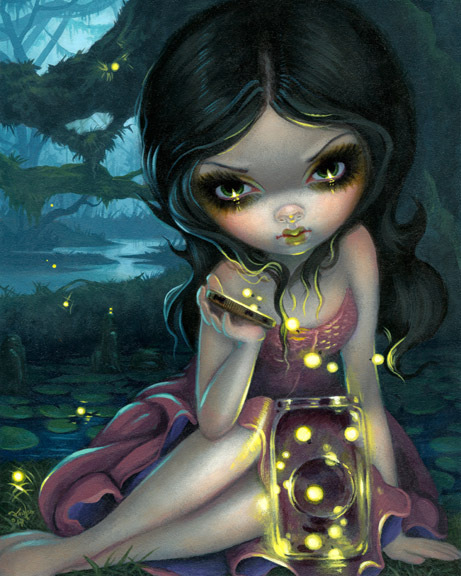 The patron got to keep the original painting, but we have prints & canvases available. When we hit our next Patreon goal I'll be giving away another CUSTOM original painting (very hard to get otherwise!) - sign up here. 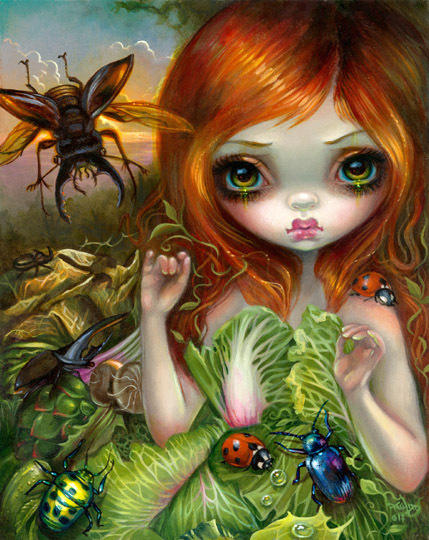 The second of my Insectarium series, this beauty sold at the gallery show of the same name! I love carnivorous plants (even though I'm a vegetarian, lol) - even though the original has sold we do have prints & canvases available! Lol, as if you needed another reason to join us at Patreon - I'm giving away an original painting on Wednesday, September 6th at 8:00PM Eastern Time here! I give away an original painting every single month at Patreon. 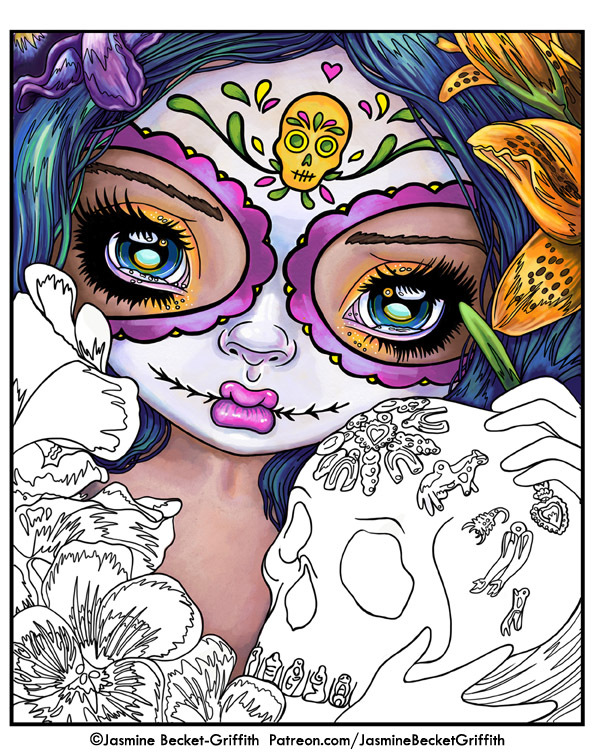 She's a 3x3" original acrylic painting on a wood panel, ready-to-hang - with a Dia de los Muertos theme! 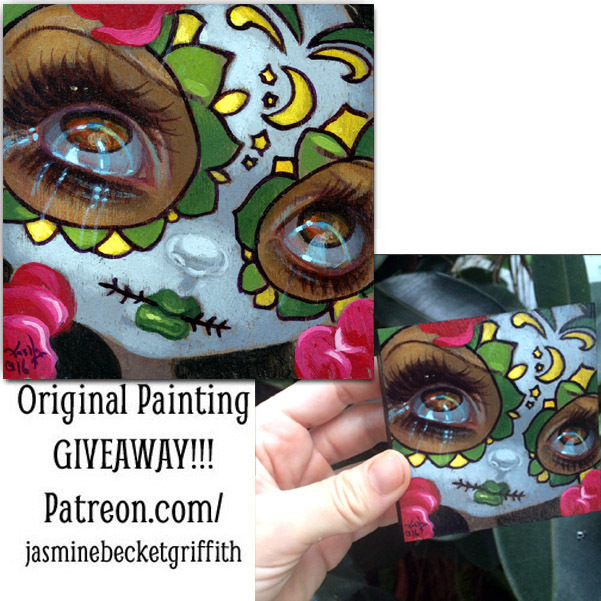 All Patrons (of any pledge level, even $1) are automatically entered into my original painting giveaways, so if you are already a member you will be included automatically in the random number generator determined selection! (As long as your account is valid - if it's been a while you might double check that your credit card & address info is up-to-date!). If you're not a member, as long as you sign up here by Wednesday, September 6th at 8:00PM Eastern time you will be entered in the giveaway (and for all subsequent giveaways!). 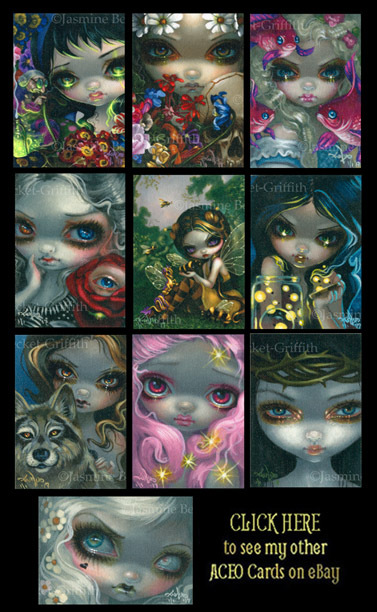 These little beauties are ACEOs - "Art Cards, Editions & Originals"
The size of a standard trading card - 2.5x3.5" - a tiny canvas print hand accented by me in acrylic paints, signed and numbered #1/1 as I only make ONE of each painting. 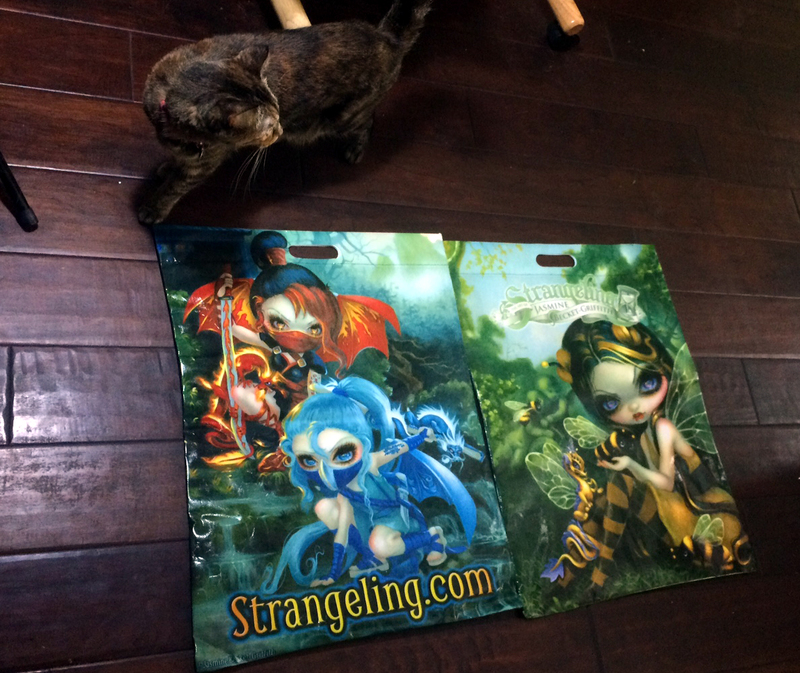 Truly one of a kind, they are a great way to start an art collection with limited wallspace (you can even keep them in plastic sleeve trading card binders) or limited budget (bidding always starts at just one penny to give everybody a chance). 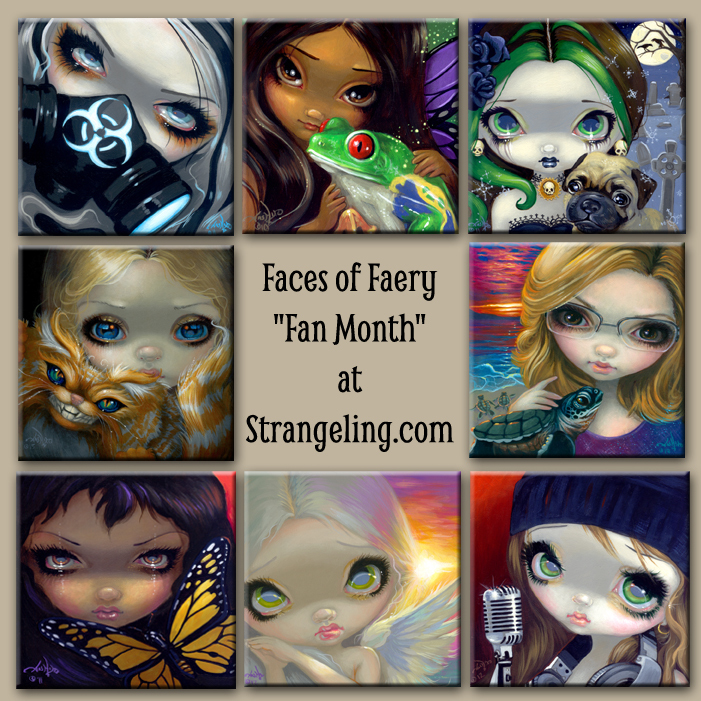 I have ten ACEO cards up for auction this week - you can see them all here! We're on our way to DragonCon! I will be at the Dragon*Con Art Show pretty much ALL DAY EVERY DAY (when not giving panels or interviews, etc.) 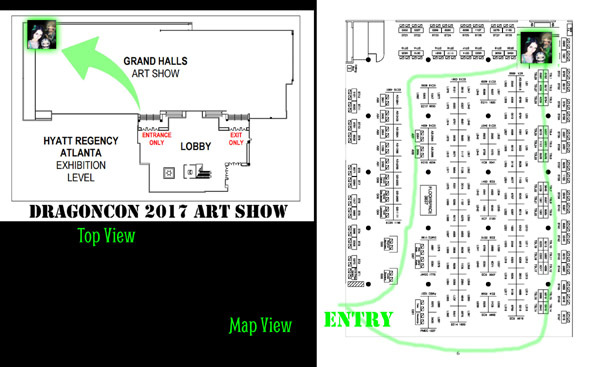 from Friday, September 1st through Monday, September 4th In Atlanta, Georgia - the Dragon*Con Art Show is in the lowest level of the Hyatt Regency Atlanta. Grand Hall WEST - same as last year, and the 11 years before! I am in the FAR BACK LEFT HAND CORNER of Grand Hall WEST as always. Map is below. Please note - for part of late Saturday afternoon/evening I have to go to a licensing meeting in downtown Atlanta. Matt will be at the booth though so you can still come buy stuff, but I might not be there for part of the afternoon to autograph. I'll be there the rest of the day though, and all the other days! I am pleased to announce officially that I am a Guest this year at DragonCon and have created the artwork for all three host hotel key cards! The Hyatt, the Marriott and the Hilton each have a new painting of mine on their keycards! 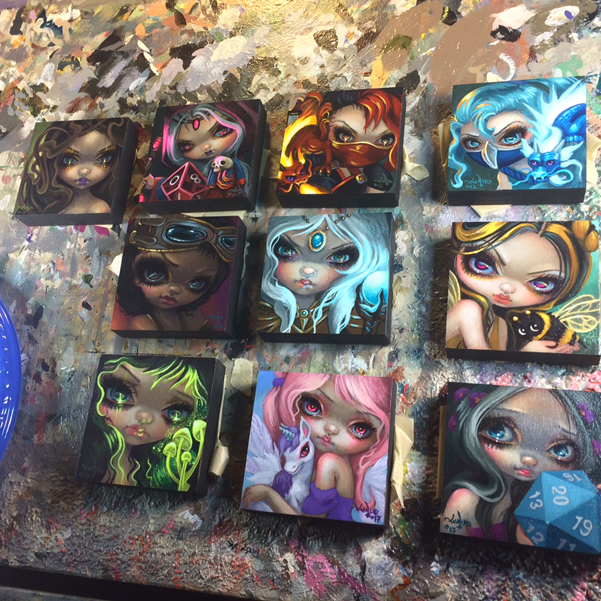 This means that as soon as you check in, you'll have a tiny painting of mine in your pocket =) Images are "Bumblebee Dragonling," "Ninja Dragonlings," and "Dice Dragonlings" - I don't know yet which hotel will have which, I'll be surprised with the rest of you! You can come and get your keycard signed - I'm doing a special programming panel at 5pm on Sunday in the Hyatt Grand Hall C programming room discussing the making of my DragonCon Key Cards and I'd be happy to autograph them for you for free! 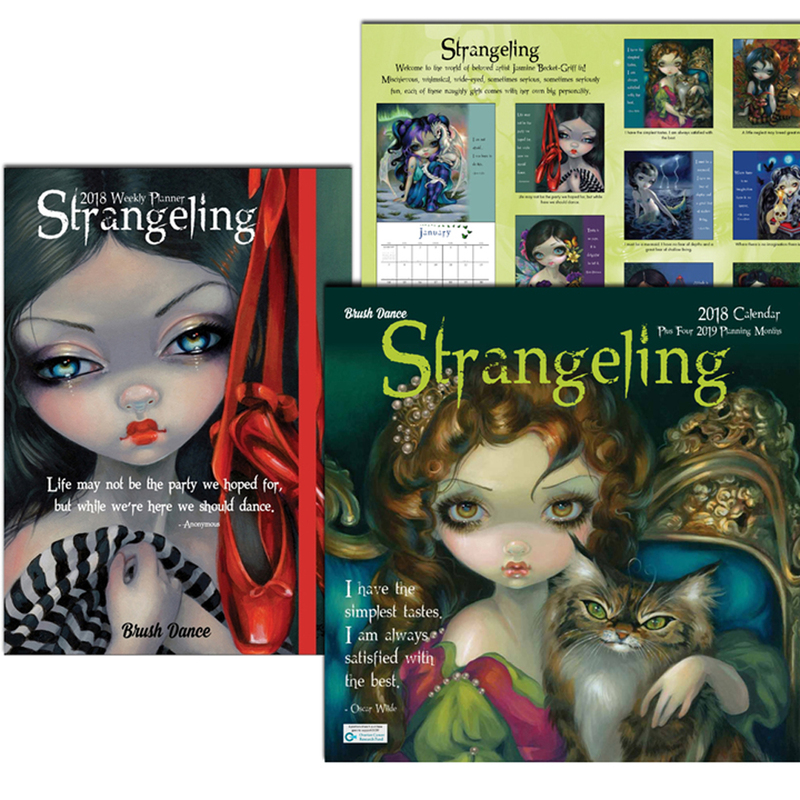 *The first TWENTY PEOPLE to come to Jasmine's booth will get a free 2018 Strangeling calendar or weekly planner, signed by Jasmine! 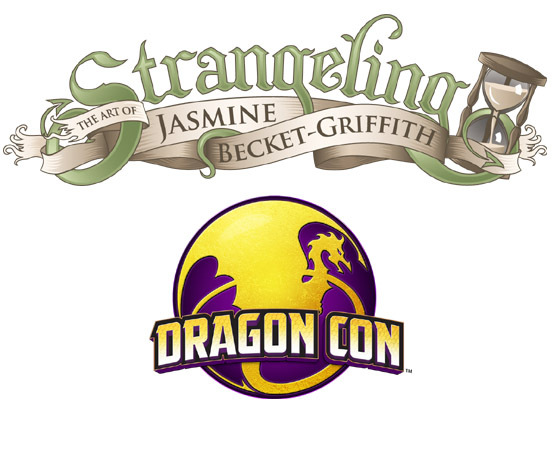 *The first HUNDRED CUSTOMERS on each of the first three days - Friday, Saturday & Sunday will each receive a different free DragonCon Exclusive Strangeling pin (a different pin each day! Free with purchase, even a $3 postcard will get you a free pin!) 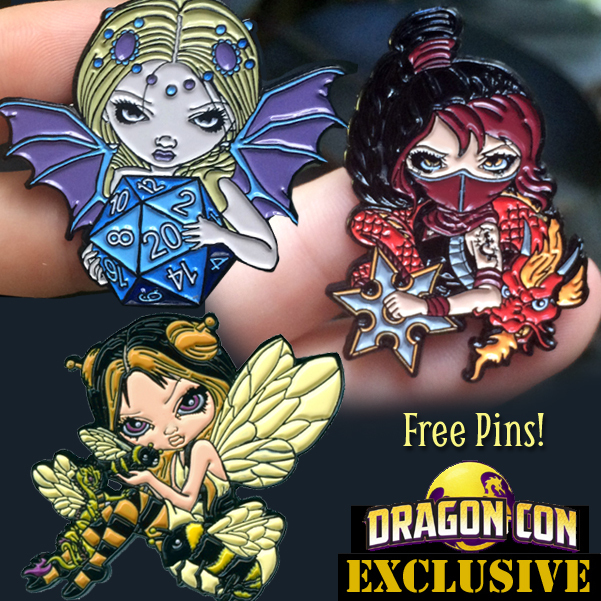 Friday will be the "Fire Ninja Dragonling" pin, Saturday will be the "20 Sided Dice Fairy" pin, Sunday will be the "Bumblebee Dragonling" pin! Also - we'll have Tiny Treasures! Ittybitty original paintings. First come, first served, we cannot reserve these. They will be found on my table in my corner, I have ten of them. *Limited Edition Canvas Prints are priced from $50-$95. *Mini prints are only $3. *Coloring Books and Oracle Decks are $25. Jasmine is happy to autograph anything you buy or bring with you from home for no charge. We accept credit/debit cards and cash. I am doing TWO PROGRAMMING PANELS this year at DragonCon! Both my panels are on Sunday, for some reason. Description: Award-winning guests share their experiences in concept art, book covers, illustrations, branding & licensing, and how they turned their dreams & passions into successful careers. Myself, Don Maitz, Dan dos Santos, Todd Lockwood & more will be hosting. 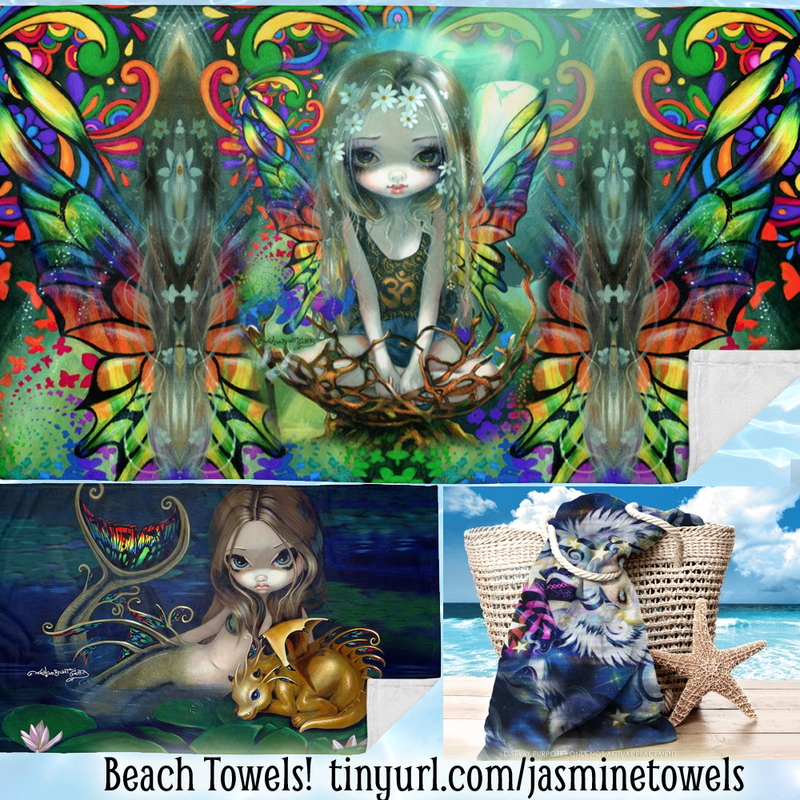 Description: Guest artist Jasmine Becket-Griffith created our 2017 Dragonling hotel key cards. Watch her presentation on the creation of these paintings, & she'll autograph your own Hyatt, Hilton, & Marriott key cards! Again - please note that the Jasmine is in the actual ART SHOW itself - located on the lowest level of the Hyatt Regency Atlanta in the Grand Hall WEST. Again - the ART SHOW, not the dealer/exhibitors stuff, not the comic/pop artist alley, but the actual ART SHOW (I reiterate this because Dragon*Con is enormous and takes over a sizable chunk of downtown Atlanta over Labor Day weekend!). *ATTENTION COLLECTORS OF ORIGINAL PAINTINGS: For this show, the original paintings are sold directly by Dragon*Con itself. 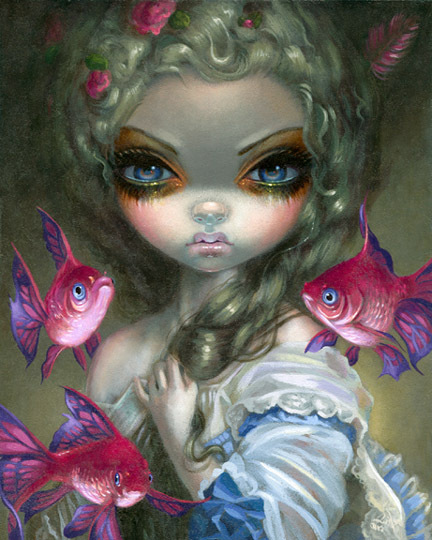 This means that I cannot pre-sell or "reserve" original paintings at this show in any way. Dragon*Con is purely "first come, first served" when it comes to original paintings. They must be purchased in person, Dragon*Con does not ship. 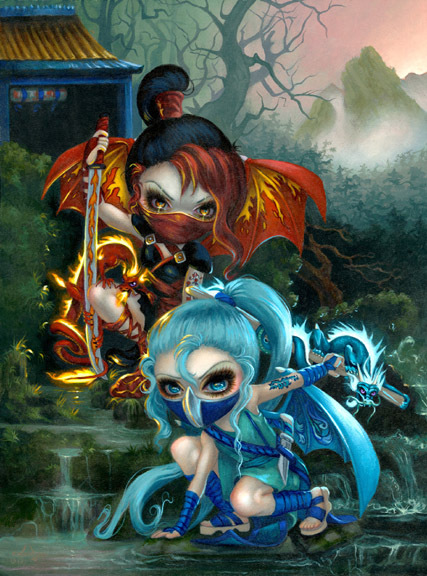 If you are interested in purchasing the limited edition canvases or originals through the DragonCon Art Show - more info can be found by carefully reading the instructions on the Art Show Buyer page HERE (click on "Buyer Information" on the left hand side). Just a head's up - many collectors may show up quite early and there is usually a line up in front of the art show hours before it opens. Don't worry too much - I will definitely bring lots & lots of art with me and there should be enough for everybody, but if there is a specific painting you have seen me show a work-in-progress pic of on Facebook, or if you collect a specific series, etc. you may want to arrive early to check on the status of the line, etc. The show opens at 1:00pm to the public on Friday, but again - if you have any specific pieces in mind it is on a first-come first-served basis (since they are sold by Dragon*Con themselves I cannot reserve or pre-sell anything) and you may want to arrive that morning to get in line (and bring a book!). Please respect other guests, do not run, do not trample, do not fight, we have lots of stuff - you don't need to knock people out of the way. DragonCon security is tight and the Fire Marshal is on hand for crowd control if things get too busy. Let's keep DragonCon a happy place that invites me back year after year! Questions - email me at JasmineToad@aol.com (don't just reply to the mailing list update, it won't get to me, you gotta make a new email to JasmineToad@aol.com). Those of you at Patreon saw this coming, but to everybody else - here's the big news! Anybody want to come with me to Africa in 2019? I'm returning, this time to run my own "Art Safari!" 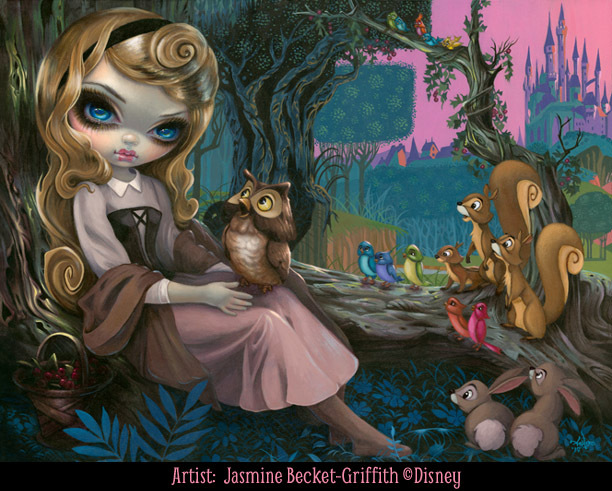 ALL the details are here (or just Google Jasmine Becket Art Safari ) and the full itinerary is available as a PDF available here Everybody is welcome, whether you are an artist, want to be an artist, just happen to like art, or just want to go on vacation with me & Matt to Africa for a couple weeks! Email matt@touricatours.com if you are in any way interested, they can hold a spot for you (that's my friend who runs the tours, not my husband Matty, hehe). There is a limit of 20 students/travelers, so even if you are only *slightly* interested, let matt@touricatours.com know asap. For a photographic odyssey courtesy of my brother-in-law Paul Andrews - he has posted photographs he took when we went on last year's trip to Africa together with our musician friends. Click HERE to see them (he is a professional photographer so they are glorious photos to entertain you either way!) Of course instead of Robyn playing concerts, our trip will have me doing artsy stuff, painting, optional workshops, etc. - but we will be visiting much the same itinerary (with the exception of some of the Johannesburg photos at the top of the page, as our trip will be slightly shorter). Tourica Tours (I can speak from experience both as a customer, friend & client) do a simply amazing job of creating a laidback but luxurious, hassle-free way of traveling around Africa. I can't wait to go back! Again -email matt@touricatours.com if you have any travel or tour related questions. Please feel free to ask me (email me at JasmineToad@aol.com , don't respond only to this mailing list update as I may not see it, just email me at JasmineToad@aol.com ) if you have any questions for me about the art side of things, or about the places we'll be visiting (as these are all places I love and have mostly visited before in person!). I hope some of you are able to join me! Again, while it is art themed you do NOT have to be an artist, this is for all skill levels and you can choose however much you would like to participate (or not). The photography opportunities on this vacation are amazing, even just with an iPhone you can get fantastic images. 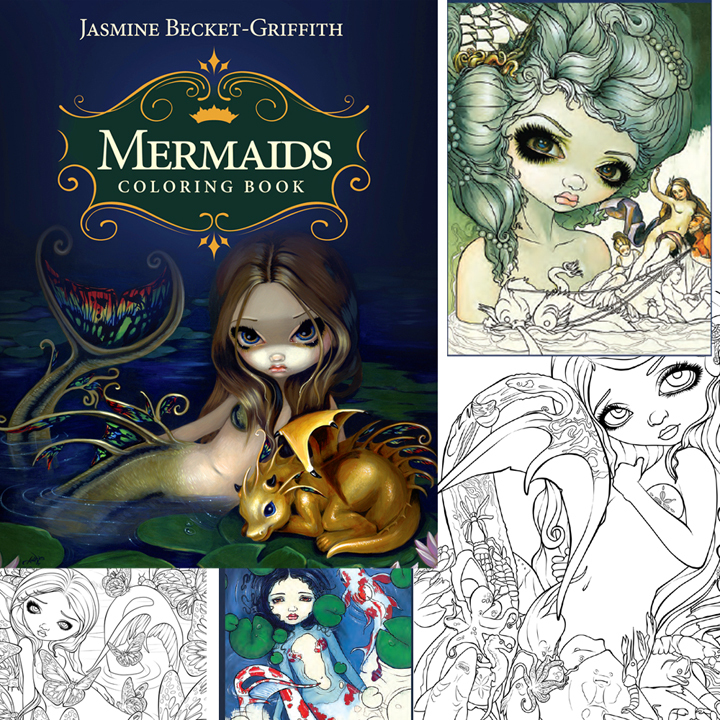 Or just bring your colouring books and colour along while I'm painting =) I'll be staying in the same hotels, eating at the same table, sitting in the same van, etc. as you all (and Matty of course) so I'm looking at this as a great way to meet some of you in person, get to be friends and have a magical journey. Check out Tourica Tours on Facebook or Instagram @touricatours ,or again, my brother-in-law Paul's photos from our last vacation Click HERE) to get a great sense of what we will see & do on this adventure! We saw everything from wild penguins to lions, from Victoria Falls to the Cape of Good Hope. Email matt@touricatours.com if you are in any way interested, they can hold a spot for you (that’s my friend who runs the tours, not my husband Matty, hehe). Please feel free to ask me (email me at JasmineToad@aol.com , don’t respond only to this mailing list update as I may not see it, just email me at JasmineToad@aol.com ) if you have any questions for me about the art side of things, or about the places we’ll be visiting (as these are all places I love and have mostly visited before in person! ).